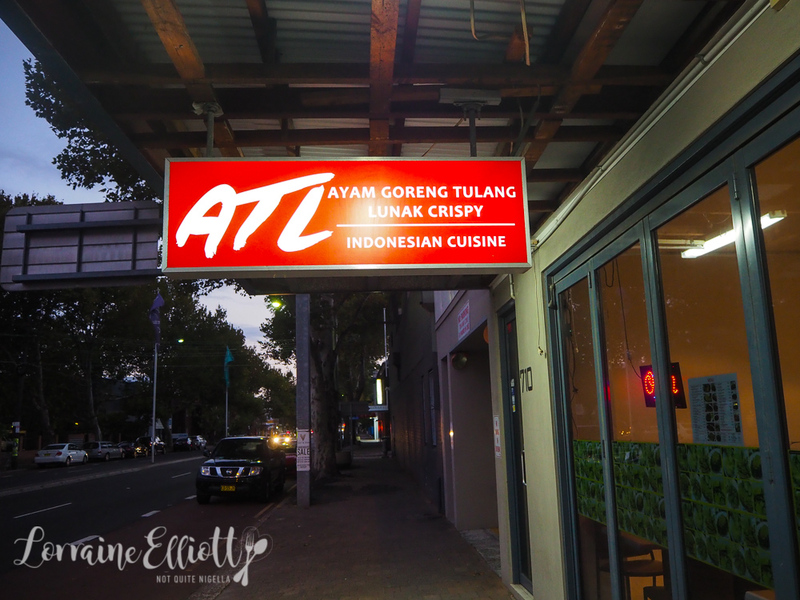 ATL-three letters that are code for Indonesian soft bone fried chicken. ATL stands for Ayam Tulang Lunak. What is that you may ask? It's chicken that has first been cooked in a pressure cooker and then cooled, breaded and then deep fried. The bones become so soft that you can eat the entire chicken, bones and all. And it's absolutely delicious. 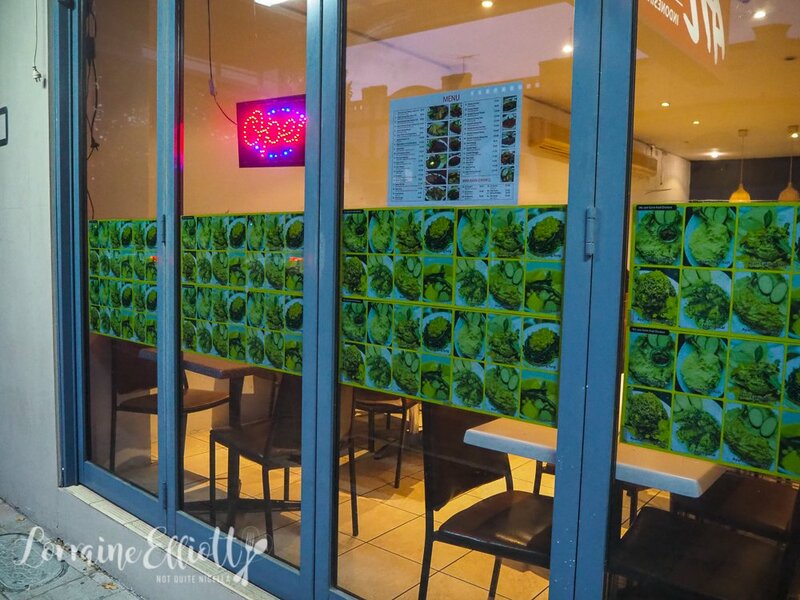 The decor is modest at ATL Ayam Tulang Lunak Crispy on Mascot's Botany Road but the welcome is warm from the owner and chef Peter. The good signs are there-the many reserved signs on the table give way to Indonesian patrons in large or family sized groups. 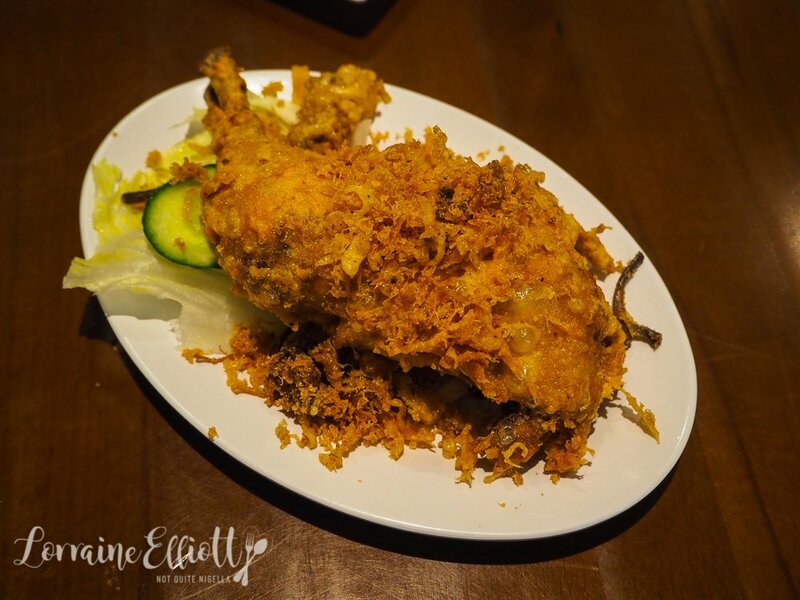 The order is the same for everyone-the soft bone chicken, rice and an extra plate of kecap manis soft bone chicken. We seem to be the only ones that are ordering anything outside of this. The owner Peter is curious about how we heard about ATL and I feel like it's too long a story to explain how I live for food and scour the interwebs for eating opportunities. 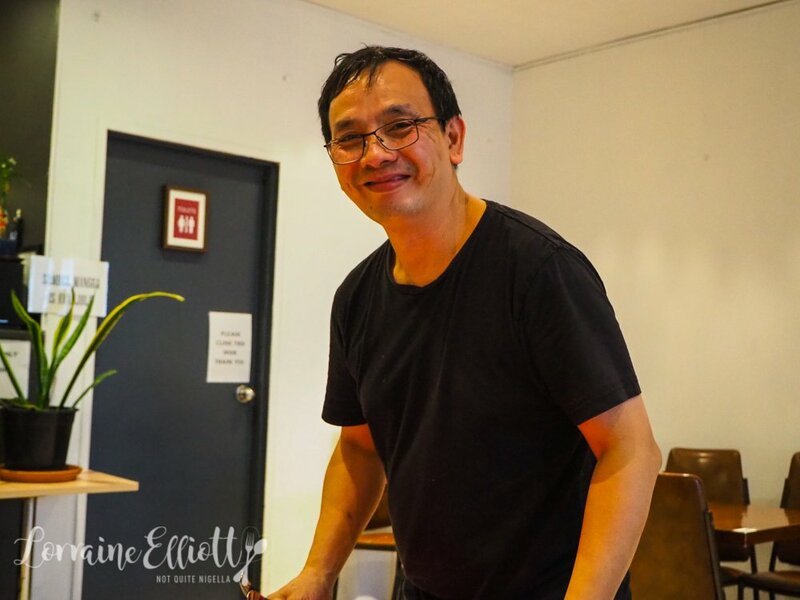 He smiles and says that if you google them, "We're the second best place in Sydney, not the first but the second best." It's humble and adorable at the same time. 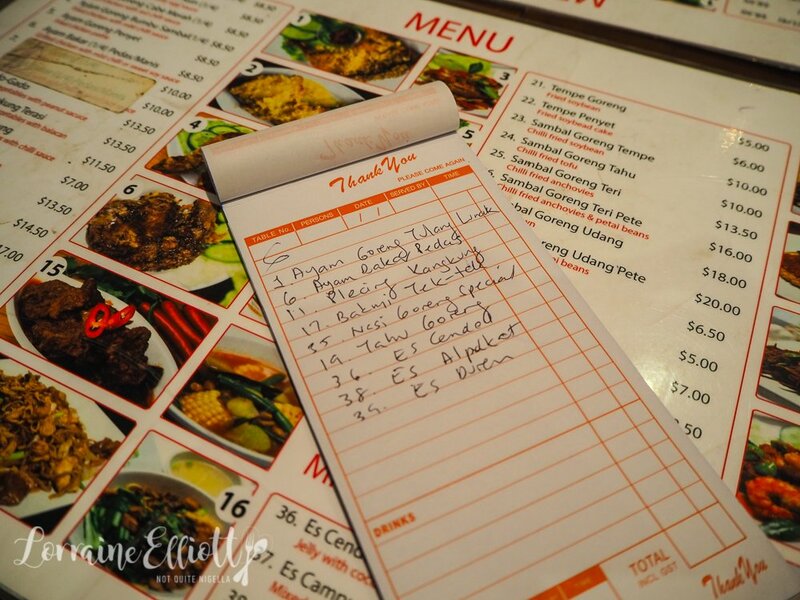 We are handed an order pad and a pen where I write down our orders. My handwriting is terrible and I hope that he can understand it. "Would you like to take a photo of me?" he asks. "Sure!" I answer. I feel as though it has somehow become my job or role to introduce Ivy to things that she hasn't tried before. 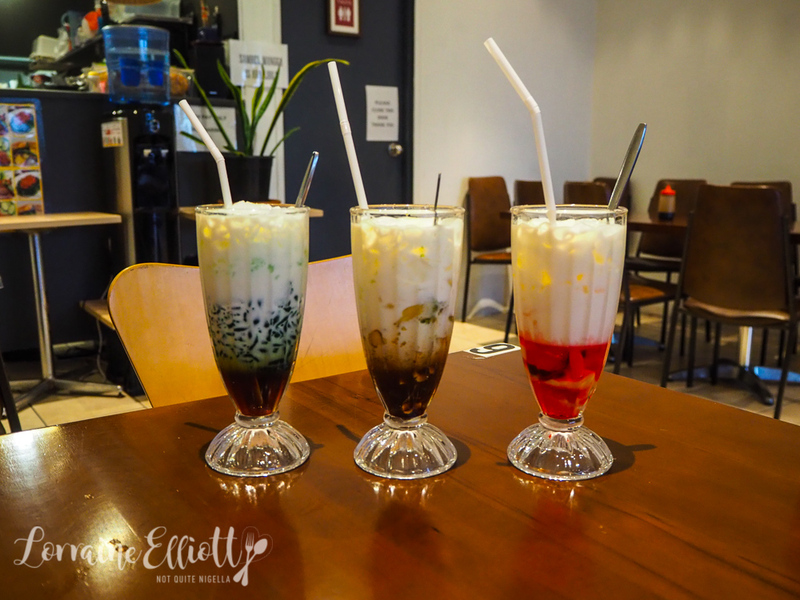 Like the rage of Indonesian drinks from Es Cendol, Es Avocado (avocado shake) and Es Durian (durian and rose drink). She is all too aware of durian but hadn't tried it. They all arrive at the same time. "Oh hell no" says Ivy when she tries the durian drink. Although I have to say that while I'm not a huge durian fan, this isn't too bad especially because of the pink rose syrup but I think this is a step too far for her especially being her first time trying durian. Mr NQN and I like the Es Duren as well as the Es Alpukat or avocado and coffee shake. And we all enjoy the sweet Es Cendol with coconut, green jelly noodles and palm syrup which is always a safe bet. Our food arrives and we are given a plate and a fork and spoon (there's a sign that says extra plates are $1). I wondered why there was no knife to cut the chicken but once I stick the fork and spoon into it I realise that a knife isn't needed. It's so soft. Even the drumstick bone is easily broken without effort. We had a choice of a breast piece or thigh and he tells us that they sell more thigh (a low and slow perve at the nearby table confirms plenty of thighs over breasts). The breading is wonderfully crunchy and goes everywhere when you cut it up leaving you to chase the crispy crumbs. 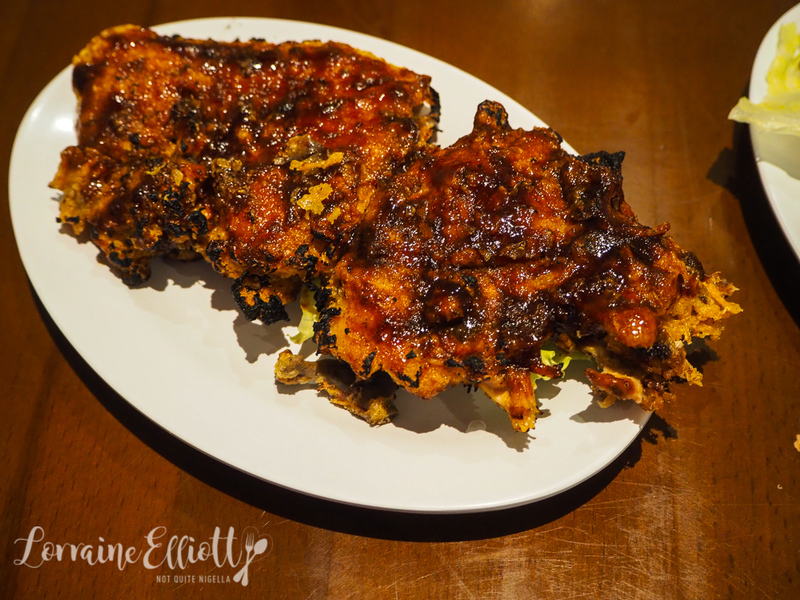 This is the same soft bone chicken but with mild chilli and kecap manis or Indonesian sweet soy sauce on top. It's also very good and I like the added heat and sweetness, especially with a bit of rice. 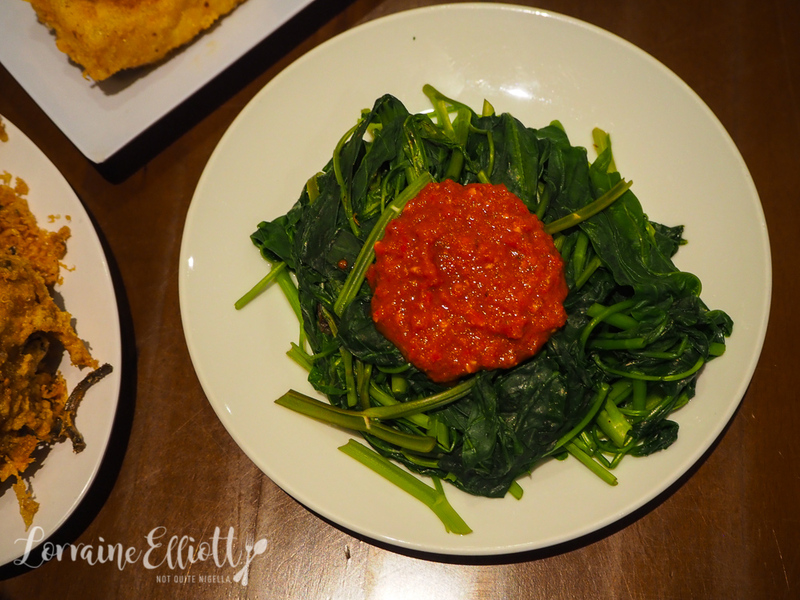 I usually like kangkung a bit crunchier and less soft than this but the sambal on top is tasty. 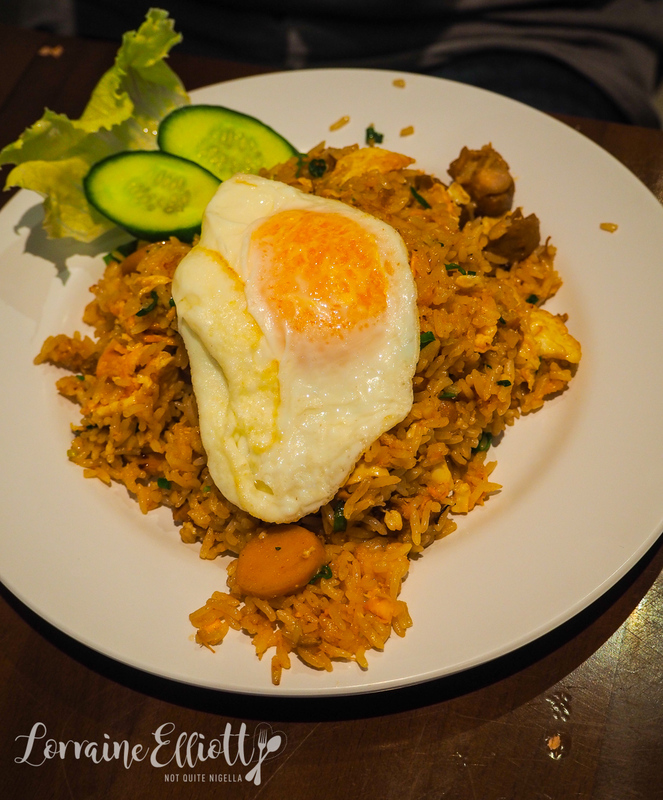 The nasi goreng special is seasoned fried rice with a fried egg on top. I'm not quite sure what makes it more special over the regular nasi goreng but it's quite good but I think next time I'll take the cue from the other diners and order plain rice which would suit the tasty chicken a bit better. 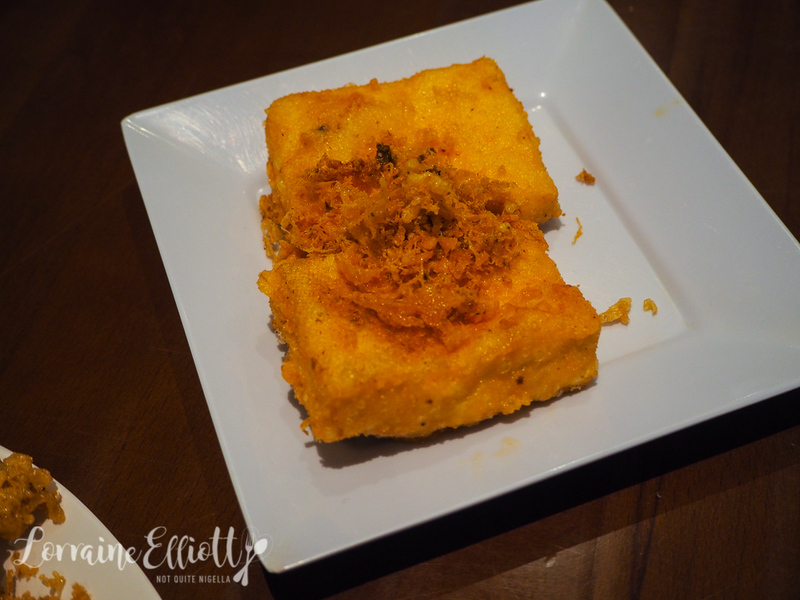 Ivy is a tofu lover so we order some fried tofu which is spongey and really good, especially with a side of the sambal mangga, a seasonal sambal made with fresh mango and chilli. 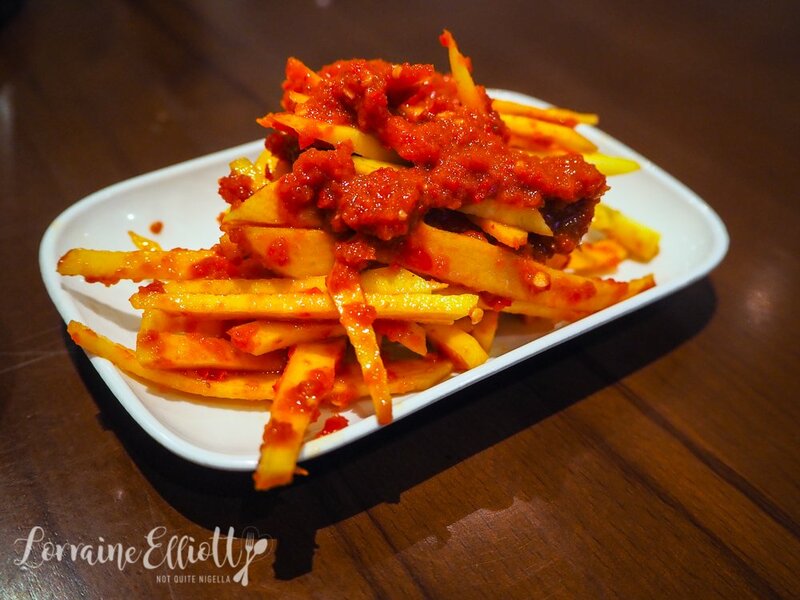 The mango tempers the chilli's heat a little and this is a delicious addition to all of the plates. 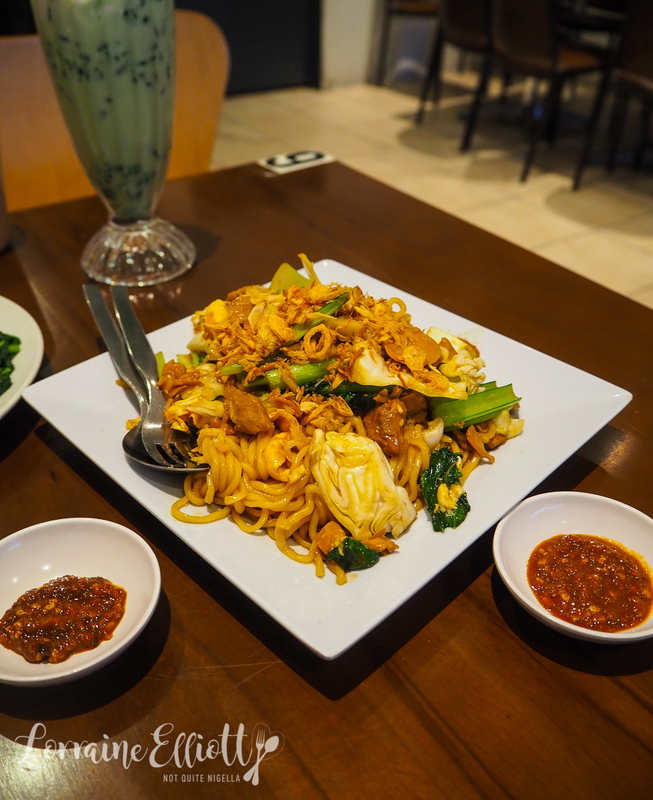 Although the noodles say that there are prawns we don't really find any although there are plenty of sliced up fish and beef balls. Which doesn't make it any less enjoyable as we enjoy wrestling with the tangle of tasty noodles. We have over ordered of course and there's enough for everyone to have lunch the next day (because spicy Indo leftovers are the best!). There's no dessert but that's ok especially with the sweet drinks that we have on hand. And the bill is a very cheap and cheerful $88.86 for three people! So tell me Dear Reader, have you ever tried soft bone chicken? Do you think you'd try it? Do you look at what other tables are ordering? 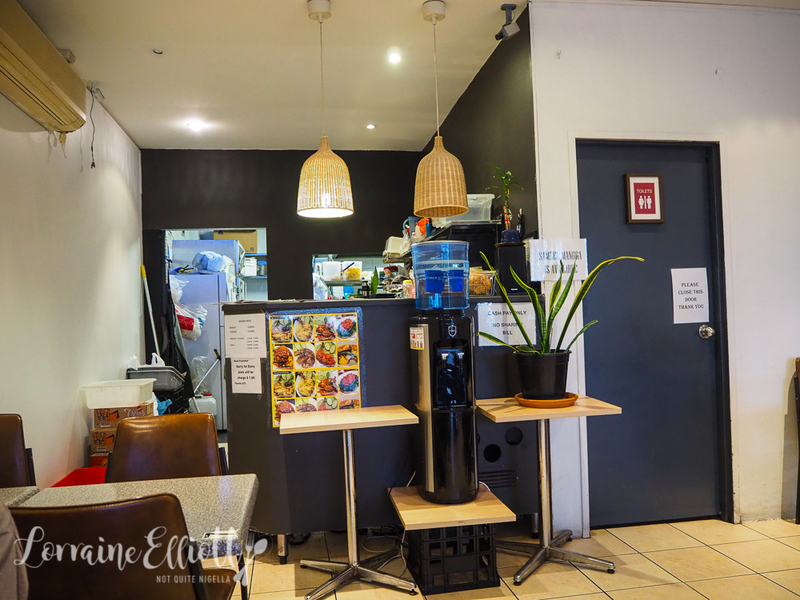 restaurantTartine, Mascot for French Open Sandwiches & Lasagna Jaffles!